← how bad is it, really? Hi there. My name is T.G. Ape. I suffer from chronic pain. You probably know me – I’m on a first name basis with most of the pharmacists and staff. Yep, that’s right, 0104, that’s me. I’ve been picking up regular prescriptions for a few different pain medications from here for about 6 months now. I bet it says so on the computer, there. I would imagine if you looked at those prescriptions, you might come to the conclusion that I have a pretty significant injury and I’m dealing with a lot of pain. Now, if you look at the top of the orange bottle in the picture, you can see that the manufacturer’s bottle doesn’t actually fit inside the orange one all that well. (Looks a wee bit too tall, wouldn’t you say?) Anyway, it may have been possible for a healthy person, with two working shoulders, to exert enough pressure to get the press-down-and-turn lid off after you crammed it on there (possibly with help of a C-clamp). 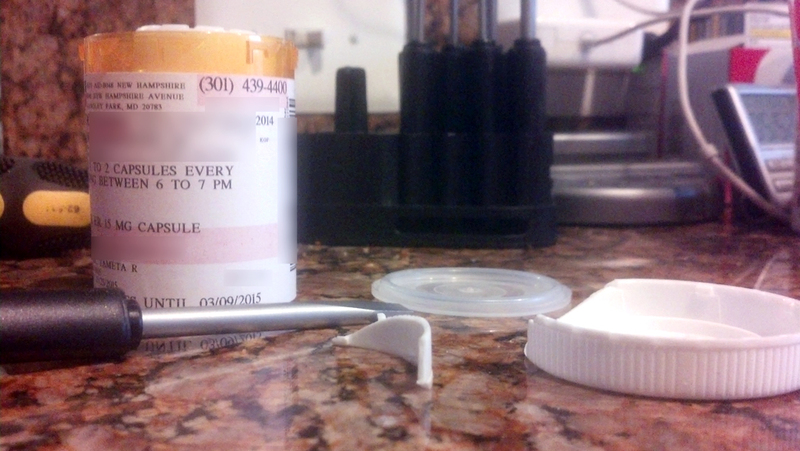 But you’d think it might be obvious that someone who gets her meds dispensed in the actual 180-pill bottle they’re stocked in may not be a healthy person capable of exerting sixty pounds of pressure onto a pill bottle in order to get the lid off of it. Now, far be it from me to tell you how to do your job. We’re just talking here, right? But maybe, in the future, if you should run into this issue again, perhaps you could use a larger orange bottle, so I wouldn’t have to wedge a screwdriver in the cap and hit it with a hammer to get it off? Better yet, if you’re trying to save plastic, maybe – call me crazy – you could just do away with the second bottle altogether and slap a label right on the original one. Just a thought. No big deal, really. I mean, we’re just talking here, right? Image | This entry was posted in Aspect I and tagged chronic pain, humor, pharmacy. Bookmark the permalink. You are effing brilliant! I’ve experienced the over-filled bottle only now they give me an easy-off top. But, then, I’ve been going to the same pharmacy for ten years. They’re starting to “get it.” Well, except when I call in one prescription that I’ve been taking for oh, about 20 plus years 10 of which (see above) I’ve been getting from the same pharmacy. Maybe it takes up too much space on their shelves. Love you.